Research News – a blog about groundbreaking studies, new evidence from research and research in progress with CPRN. The CPRN Community Registry allows members of the community to participate in confidential surveys about their experience with CP. This information is used by CPRN researchers to understand the natural history of CP to generate new knowledge for future research and enhancements to services for people with CP. It also allows CPRN to find members of the community who want to participate in clinical trials or other studies. All information gathered in the CPRN Community Registry is stored securely at the University of Utah under the guidance of the University of Utah ethics board (institutional review board). The MyCP forum provides member to member discussions about important research topics such as “what is the most pressing thing to study in CP?” MyCP members includes people in the community with CP, their caregivers, advocates, clinicians and researchers. All identities are protected and the discussions are not accessible by non-members or search engines. MyCP discussions help direct the course of research at CPRN. Cerebral Palsy (CP) –Cerebral Palsy is the most common, lifelong motor disability caused by an early developmental brain injury. The mechanism of injury underlying CP is still not well understood, therefore the Committee encourages NCBDDD to use existing resources, networks, data sets and systems in infant health to improve CP surveillance and develop better understanding of the mechanisms leading to earlier diagnosis and better outcomes. While the Hammersmith Infant Neurological Exam (HINE) for early detection of cerebral palsy hasbeen developed and is being utilized by the CDC in other countries in response to the Zika virus, the standardized tools used for early detection are not being widely utilized in the US, and few providers are using these as standard of care. The Committee requests that CDC share early detection guidelines with pediatric providers and develop a US implementation plan. The Committee requests in the fiscal year 2021 CJ report on the cause, earlier diagnosis and treatment of CP across the lifespan. Cerebral Palsy (CP) – The Committee commends NIH (NINDS) for implementing Funding Opportunity Announcements (FOAs) for clinical research supporting observational studies that are well suited for the study of Cerebral Palsy (CP). The Committee strongly encourages NIH to prioritize and implement additional FOA’s to significantly strengthen, accelerate, and coordinate cerebral palsy research priorities across the lifespan identified in the five-year CP Strategic Plan. FOAs should target basic and translational discoveries, including genetics, regenerative medicine and mechanisms of neuroplasticity, as well asclinical studies aimed at early intervention, comparative effectiveness and functional outcomes in adults. The Committee also encourages, in conjunction with key stakeholders, that a follow-up workshop be held to further refine the specific opportunities that were identified in the NIH strategic planwith the objective of establishing CP-specific funding opportunities to address identified gaps. NICHD is also encouraged to coordinate with other agencies, including CDC, to support additional research on preventing, diagnosing and treating Cerebral Palsy. CP Collaborative Members served on a panel at the 2018 UCP National Annual meeting in St. Louis, MO on April 29th, 2018. The purpose of the panel was to inform the national UCP affiliates of the resources, services and activities of the various cerebral palsy related organizations and give guidance as to how we as a community can better collaborate. 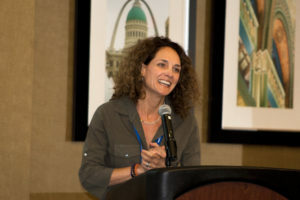 Anita Porco, VP of the UCP Affiliate Network, served as the moderator for the panel. 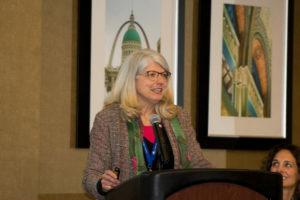 Terry Such-Neibar, M.D., Chair of the Advocacy Council of the AACPDM spoke about the variety of resources available to UCP affiliates and their clients through the AACPDM. 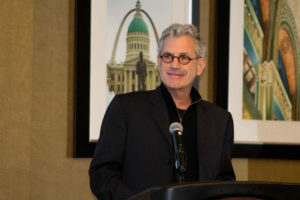 Richard Ellenson, CEO of CPF spoke about opportunities for collaboration with UCP affiliates and a variety of initiatives that CPF is spearheading to promote awareness, participation, education, health and wellness of those with CP. Jennifer Lyman, Coordinator of the CP Collaborative spoke about all of the remaining CP Collaborative member organizations and their various resources and initiatives, as well advocacy for the CP community. Jennifer also spoke on behalf of Paul Gross, Chairman of CPRN and presented the organizational structure, background, research initiatives and ways CPRN envisions UCP affiliates and CPRN can collaborate. We are grateful to have UCP as a member of the CP Collaborative and look forward continued efforts for this community to work together for the benefit of all those who are impacted by cerebral palsy! CP Collaborative member group Reaching for the Stars has once again ensured that March 25th is designated as National Cerebral Palsy Awareness Day. The Collaborative wishes to thank RFTS and Senator Isakson (R) of Georgia, sponsor of this resolution, for their efforts on behalf of the entire cerebral palsy community. Mission: To bring together professionals and individuals in the local region interested in improving health and quality of life of individuals with cerebral palsy. We had our first collaborative meeting was on June 23 2017 at Shriners Hospital for Children, Springfield Massachusetts. 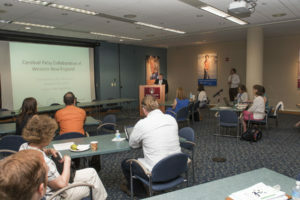 Clinicians and researchers concerned with the health and wellbeing of children and adults with CP in the Western New England area discussed strengths, weaknesses, opportunities, and threats to providing optimal care. It was decided that for our next meeting we will invite more families and adults with CP to hear their perspectives and decide upon goals and actions. Executive summary of the meeting can be found here. Our first step after the meeting was to gather information about resources available for community fitness for individuals with disabilities. See listings gathered to date here. Our next meeting is June 8, 2018! The plan is to hear from families and consumers their issues and concerns and formulate a strategic plans and actions to further our mission. We plan on a movie night “Including Samuel” in April at Shriners Hospitals, Contact Mary Gannotti Gannotti@hartford.edu if you are interested in showing it your hospital or organization. The 2018 LHHS Appropriations Bill has been approved and published. We are glad that this bill has the strongest language in support for Cerebral Palsy research and surveillance to date and are looking forward for the CP community being able to capitalize on the work that is already being done at the CDC and NIH. We were able to get everything in the bill that we asked for except the 5 year strategic plan at the CDC. We will be following up this week to gain further feedback on understanding how we can better move forward with the CDC. The language at the NIH is strong and can help the CP Community of researchers and patient advocacy groups work collaboratively to gain more grants for research opportunities. I would love for this group to talk about some priorities and a plan to move forward in working to pull through these opportunities at the NINDS / NICHD. Cerebral Palsy [CP].—The Committee encourages CDC to build upon existing surveillance and research applications of CP surveillance within the established 11 Autism and Developmental Disabilities Monitoring Network surveillance sites. The Committee recognizes and supports CDC’s efforts to include CP surveillance in three existing sites and encourage CDC to expand this effort within current resources to additional sites allowing for a more nationally representative sample. Cerebral Palsy [CP].—The Committee commends NINDS for developing the CP 5-year Strategic Plan and urges NINDS to implement Funding Opportunity Announcements in support of the top priorities and increase its CP research efforts for prevention, treatment, and cure through the lifespan. The Committee encourages funding for basic and translational research (including regenerative medicine) for improved outcomes for patients with CP, and recommends collaboration with the research and advocacy community. Furthermore, the Committee recommends that NIH form a transNIH working group of program officers who manage their Institute’s CP portfolio and that this group regularly interact with CP patient advocacy groups. 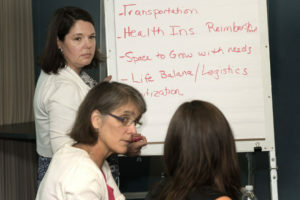 Participants were highly engaged in sharing challenges and success, networking, and brainstorming on the region’s strengths, weakness, opportunities, and threats to improving the health and wellbeing of individuals with cerebral palsy across the lifespan. The group plans to capture more information from families and individuals with cerebral palsy via a survey this fall and hold additional meetings in October of 2017 and March of 2018 to develop goals and a strategic plan. The group is highly energized to impact local policy, service delivery, and to provide education for the empowerment of providers, families, and individuals. The University of Hartford Institute for Translational Research and the Shriners Hospitals for Children sponsored the event. BlazeSports America (adaptive sports and recreation nonprofit organization), in collaboration with CP Collaborative member Reaching for the Stars, with sponsorship by Ipsen pharmaceuticals is hosting an educational series of “town halls” called “Blazing New Trails” for patients, families and practitioners in markets across the U.S. The Blazing New Trails Town Hall format is designed to provide families access in one place to a variety of local cerebral palsy experts – neurologists, physical therapists, occupational therapists, physiatrists, orthotists and assistive technology experts. These will be 90 minute events that will also include a family perspective. Each Town Hall will feature a multi-disciplinary panel discussion with local care team members highlighting the latest updates in overall management, physical and occupational therapies, as well as adaptive technologies. The Blazing New Trails Town Hall events will also be available on CPTV. The CP Collaborative member organizations will provide educational materials and information about the variety of services and supports available to individuals with CP and their families at each of these town town hall events! CP Collaborative of Western New England! Please welcome the CP Collaborative of Western New England, which will bring together, researchers, clinicians, and families to build a network to improve services and practice along the Highway 91 corridor in CT and MA. This includes Yale, CCMC, Shriners and UCP of Berkshires along with Oak Hill and others! The representative for the CPC of WNE is George Gorton, MS, CCRP. Mr. Gorton is the Director of Research, Planning, and Business Development at the Shriners Hospitals for Children at Springfield MA. 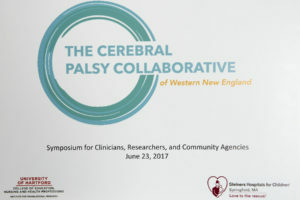 The CP Collaborative of Western New England is the result of the efforts of Mary Ganotti, PT, PhD who got support from Hartford University and Shriners Hospitals for Children to have a meeting in June of this year. Moving forward they will have at Strategic Plan and Action Items, including a web page which they will post links to CPRN, CPNOW and CP Collaborative (National) along with local research projects, providers, services, and links to fact sheets. 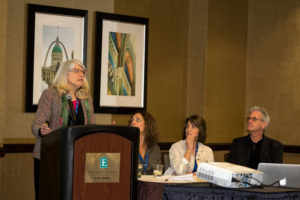 CP Collaborative members, CP NOW and the Cerebral Palsy Research Network (CPRN) were awarded a PCORI Grant in late December to host a conference to entitled “Setting a Patient-Centered Research Agenda for Cerebral Palsy” (or Research CP for short). The conference, which will be held in Chicago in mid June 2017, is preceded by an educational webinar series on research, quality, registries and patient-centered research outcomes so that everyone at the conference has a common language. The webinars and conference will be open to the public virtually and the in person workshop will be open to 35 people (including stipends for the community participants). The workshop will be approximately 20 people from the community and 15 people from the provider side. Collaborative members are helping to promote this opportunity to shape a patient-centered research agenda with their constituents.